The global community has set forth a new goal to tackle the scourge of land degradation and desertification. It could be real breakthrough. 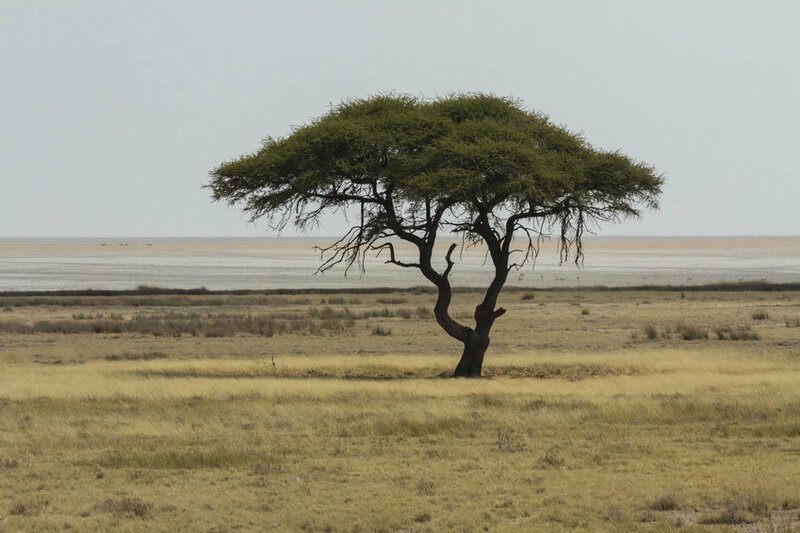 The United Nations Convention to Combat Desertification (UNCCD) had a ‘breakthrough moment’ after two weeks of discussions and negotiations in Ankara, Turkey in October. The 195 parties to the Convention agreed to a global deal that set a new environmental target: Achieving “land degradation neutrality” by 2030, and thus maintaining the world’s stock of healthy, productive land at a stable level. Currently, 12 million hectares of land is being degraded annually via deforestation and forest degradation, the degradation and loss of agricultural land, and rampant infrastructural development. But the new deal at Ankara commits the UN’s members, albeit on a voluntary basis, to restore or rehabilitate at least that much land area every year, which at least will keep things from getting worse. If that goal can be achieved by 2030, then the global community can look toward an even more ambitious target to gradually enable a major net increase in healthy land in future decades. 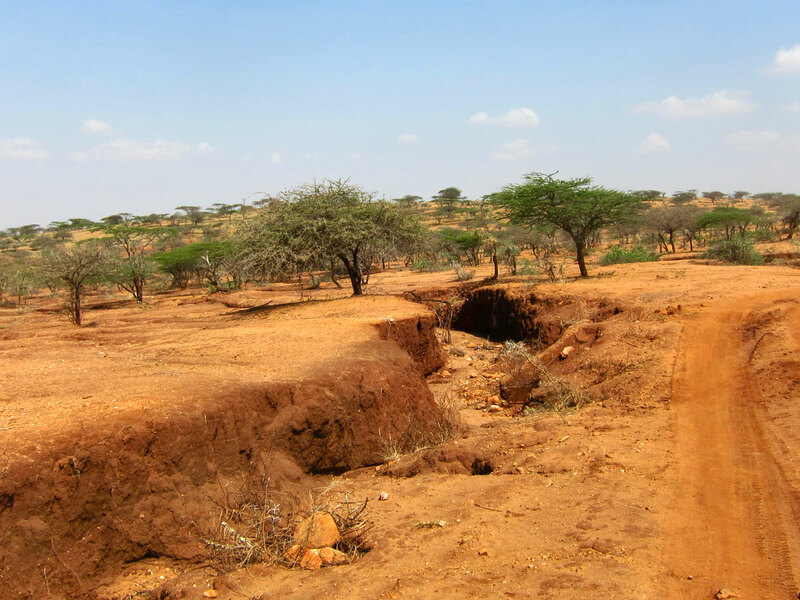 The Land Degradation Neutrality target had already been included in the Sustainability Development Goals that were agreed by the UN General Assembly this past September. But the UNCCD decision takes that a major step further by setting in motion a framework whereby the target can be achieved through practical actions on the ground by virtually all countries. The endorsement also entails an expansion in the role of the UNCCD. The Convention had previously focused on attempting to counter the rapid degradation or desertification of productive drylands, especially in Africa. It will now actively promote and assist land degradation neutrality in non-arid areas across the world as well. The scientific definition of land degradation neutrality that was adopted by the conference applies universally to all countries, and thus a significant shift has occurred. “That is the fundamental change that has taken place,” noted UNCCD executive secretary Monique Barbut. The agreement is likely to have an impact on the UN climate change conference that is convening in Paris in early December, following close on the heels of the UNCCD meetings. Ms Barbut stressed the enormous climate benefits of reclaiming degraded land. These include not only making farming more resilient to climate change through the adoption of such practices as agroforestry, and evergreen agriculture in particular, and increasing food production in rainfed environments, particularly on millions of smallholder farms, but also in sequestering huge amounts of carbon dioxide. She noted that the full achievement of the land restoration target could reduce global warming by half a degree C. This will help substantially to close the gap between the sum of what countries have so far voluntarily committed to reducing their emissions of greenhouse gases, and the level of emissions reduction that is needed to limit global warming to 2 degrees C: The level currently estimated to be essential to avoid catastrophic climatic consequences. The new global deal opens a wide new window of opportunity for EverGreen Agriculture impact in the coming years. Farmer-Managed Natural Regeneration (FMNR) is the fastest-growing form of EverGreen Agriculture in Africa. It is especially popular in the drylands where droughts are frequent and intense. Because it requires minimal or no cash investment, it can expand rapidly through farmer-to-farmer and village-to-village diffusion. A dramatic case in point is Niger, where more than 5 million hectares of medium-to-high density tree cover has been regenerated on croplands over just a couple of decades (see photo). But Niger is just the tip of the iceberg. 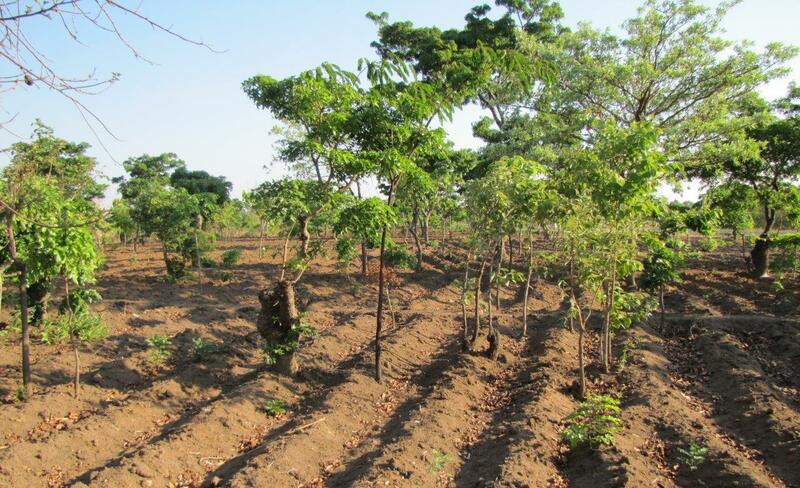 A recent study carried out in Niger, Mali, Burkina Faso, and Senegal found that almost all farmers are actively regenerating trees on their farms. FMNR is also widespread in Ethiopia and Malawi, and is now being promoted in many other countries through various initiatives and development projects. This phenomenon is examined in a new book just released by the World Bank that examined this trend and looked at what it means for farmers (insert web site here). More than 100 woody species are currently being managed by Sahelian farmers through natural regeneration. The benefits from FMNR vary from location to location, depending on which tree species are present in the area, and what products and services are valued locally. They contribute products for human consumption (more than $200 per household per year) which is a major part of overall income, and they provide feed for livestock during the dry season, and increase crop yields by 20-25 percent. These tree-based systems enhance the capacity of households to cope the effects of shocks. Trees are assets that can be cut and sold for cash in times of need. In south-central Niger, where 1.2 million households now sustain many trees on their crop fields, farmers cut tree branches on a continuous cycle for household fuel wood supplies and for sale. Some mature trees are cut down and sold in local wood markets. Export markets are active in shipping wood south to Nigeria. During prolonged drought periods these tree assets may be gradually liquidated to supply the household with cash for food purchases. This process was observed to be an important source of coping capacity during recent droughts. The EverGreen Agriculture Partnership is currently working with the AU Commission to develop a platform that could facilitate, support and better coordinate the many efforts at the regional, national and local levels that are now under way to realize this goal. Such a platform could inspire deeper political commitment to the goal, and provide a mechanism to underpin greater investments to accelerate the process of scaling-up. For more background the practice of FMNR see: FMNR Hub Website and evergreenagriculture.net. Six hundred million people, two-thirds of the population of sub-Saharan Africa, are still without electricity. In Malawi, for example, only 7% of the population has access to electrical power. This is an enormous drag on rural economic growth, and on improved outcomes in food production, health, and education. Ninety-percent of the sub-Saharan African population currently relies on firewood and charcoal as their primary source of energy for cooking, heating and other uses. Experience now shows that tree-based systems can simultaneously provide electrical and bioenergy for the home and for industry, while also providing biofertilizers for crop production, and better-quality fodder for livestock production. These systems have the potential to transform livelihoods and food security, and enhance economic development while conserving the environment. The approach overcomes concerns that growing crops for bioenergy might compete for resources with food production. On the contrary, through the concept of EverGreen Energy, fertilizer-fodder-fuel wood trees are incorporated into crop fields to provide the feedstock for power generation, while at the same time they directly increase crop yields, provide enhanced high-quality livestock fodder, improve vegetative soil cover year-round, increase soil fertility, and buffer crop production from drought and higher temperatures due to climate change. They also store much greater quantities of carbon in the soil, and enhance biodiversity. Similar to Africa, much of Sri Lanka’s rural population is completely off-grid and without any electrical power. This situation has fostered a real innovation in the power sector. During the past 25 years, partners have worked to develop a dendro power industry, largely based on gliricidia as a feedstock. Gliricidia is so widely grown by Sri Lankan farmers that it is officially designated as the country’s fourth plantation crop (along with coconut, tea and rubber). Lanka Transformers Limited (LTL) installed a 35 kW generator operating exclusively on Gliricidia wood as a demonstration unit. Upon achieving operational success, LTL together with Ankur gasifier systems (Ankur Scientific Energy Technologies Pvt.Ltd) launched community-scale 4 KW and 9 KW systems using Gliricidia feedstock from smallholders for electricity generation. 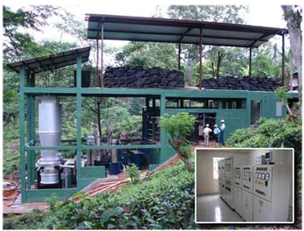 The Ceylon Tobacco Company (CTC) then established a commercial-type 1MW power plant in Walapane. This plant demonstrated all aspects of converting gliricidia to supply the national electricity grid. The success of this plant sparked the interest of the private sector. 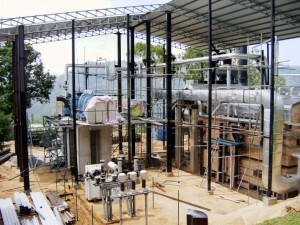 The Bio-Energy Association of Sri Lanka was formed, and through the Sri Lanka Sustainable Energy Authority, established the inclusion of dendro power to meet national energy demand. In 2009, Tokyo Power constructed and commissioned a 10 MW gliricidia-fueled plant in Trincomalee, Sri Lanka. Following its success, the company recently commissioned a second plant of 5 MW capacity in Mahiyanganaya early in 2014. There is a 500 kW plant in Thirappane (Anuradhapura) and a 15 MW plant in Embilipitiya. The Midas Safety factory in the Seethawaka Export Processing Zone in Avissawella, manufactures gloves for the export market, primarily Europe, and the factory has been using Gliricidia as a power source since 2007. They have two 400,000 BTU plants that use biomass as an energy source, and all energy generated from the plants are used to drive the machines within the factory. The factory has subcontracted the sourcing of Gliricidia to a local farmers’ organization, which in turn mobilizes farmers and farmer groups in the area to provide stalks to the factory. However, due to great demand in the area, particularly amongst other factories within the Export Processing Zone, coupled with the stagnant Gliricidia production levels, currently only about 10% of the biomass need is being met. The remaining is met using rubber wood, which according to estimates within the factory, will be sufficient until 2018. A private farm has installed two gassifiers, of 3.5kv and 35kv capacities respectively that use Gliricidia as fuel source. The 3.5kv gasifier is used to power the drip irrigation system in the farm, and can power a further 5 houses. Primarily used at night for both the irrigation system and the houses, the gasssfier uses about 20kg of Gliricidia per hour. The larger 35kv gasifier is used to power a coir manufacturing plant and 10 houses, using electricity from the grid to start the machine. This cost LKR 400,000 upon installation and caters for maintenance costs (cleaning the machines after 100 hours of operation). 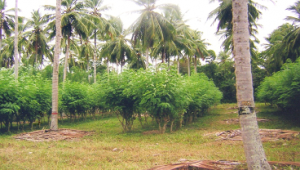 The Coconut Research Institute plantations have pioneered a model of using Gliricidia as cow feed mixed with straw. Currently operating using 6 cows, the cows are fed the mixture and their waste fed into a biogas chamber to generate electricity. 5.2 cubic meters of gas is produced by the cow waste in the biogas plant, which in turn supplies 1 house with enough electricity to run electric bulbs and a television. The system, when installed in 2005, cost LKR 500,000, primarily for the biogas chamber and the generator that is powered by the biogas. 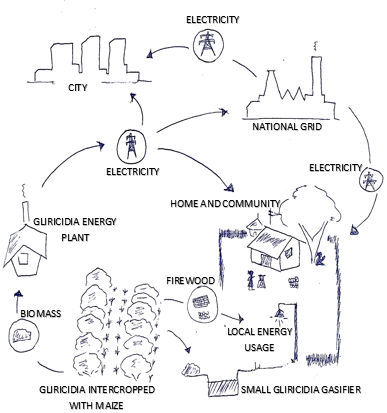 Vidul Biomass is currently constructing a 3MW Gliricidia powered power plant, at a cost of $12 million. In order to supply this plant, they have established a 100 acre plantation, and have also subcontracted 300 farmers to supply the biomass, using trees grown in their own fields. 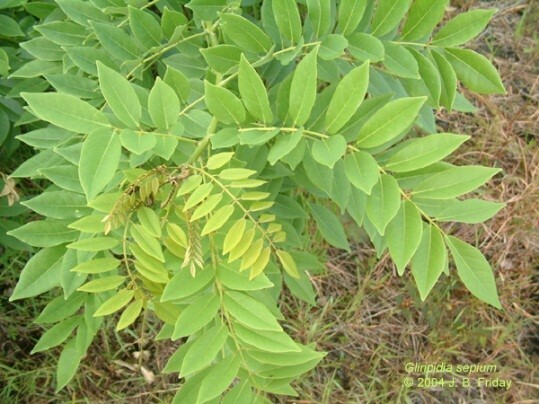 The plant is estimated to require 30,000 tons of Gliricidia per year, and Vidul Biomass is looking at establishing further plantations to supplement the above mentioned sources of supply. 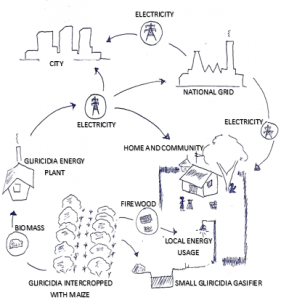 The Evergreen Food-Energy Initiative is focused on developing a scalable energy industry in rural Africa based on the existing successes with Gliricidia in Sri Lanka. By integrating beneficial tree species directly into small holder farming systems, a range of energy needs from wood fuel to biodiesel to electrical power can be generated for rural communities without sacrificing crop area, but rather, in fact, enhancing crop production. Now eight such Gliricidia-based power plants that were built and operated by private sector companies in operation in Sri Lanka, and that some 10 or more plants are under construction or in the feasibility stage. Sri Lankan Carbon Fund is an entity engaged in developing new Gliricidia power projects. 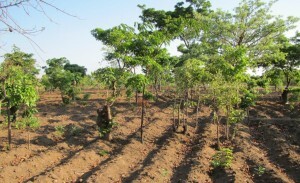 Bainton Capital Partners is actively seeking investors for new Gliricidia projects (http://www.baintoncapital.com/sustainable-rural-woodchip-production-in-sri-lanka/) and The Biomass Group (http://www.thebiomassgroup.com/) is an investment advisory company also focusing on developing new Gliricidia biomass projects. Thus, conditions are ripe to forge collaborative relationships between Sri Lanka and Africa to forge ahead in exploiting the Sri Lankan experience in Africa through the World Agroforestry Centre’s presence and networks that span these countries, and that can build an evergreen agriculture energy industry based upon three decades of research in many countries, and the upscaling of gliricidia as a fertilizer tree that is already proceeding on a national level in Malawi and Zambia. Gliricidia is already widely distributed in farming systems throughout Africa, having been introduced four centuries ago. Research during the past three decades has demonstrated its value as a superb fast-growing nitrogen-fixing fertilizer tree. In Malawi, gliricidia is a major species underpinning the scaling-up of fertilizer trees for increasing crop yields in maize-based systems through the National Agroforestry Food Security Program. Practical systems for intercropping trees in maize farming have long been developed, and they are currently being extended to hundreds of thousands of farmers in Zambia and Malawi. They are being massively scaled-up in eastern Zambia, where 25 million trees were planted by smallholders during 2013 alone. The development of food-energy electrification projects would be a natural extension of the type of crop production systems practiced in these two countries. The species has also been widely tested and is well-adapted for such food-energy systems in Tanzania, Kenya, Ethiopia, and many other countries across the African continent. African agriculture must be transformed in the coming decades. With a population burgeoning to 2 billion people, at least twice as much food must be produced per year by 2050 to avoid widespread starvation. But food production per capita has been declining since the 1960s, and cereal crop yields have remained stagnant. In the face of this dire situation, observers are pointing to a perfect storm of further challenges. EverGreen Agriculture is now emerging as an affordable and accessible science-based solution to regenerate the land on small-scale farms, and to increase family food production and cash income. EverGreen Agriculture is a form of more intensive farming that integrates trees into crop production systems at the field, farm, and landscape scales. 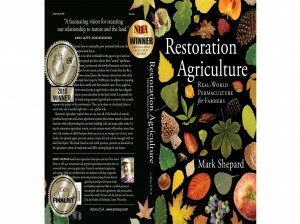 The vision is sustaining a green cover on the land throughout the year. EverGreen farming systems feature both perennial and annual species (trees and food crops). 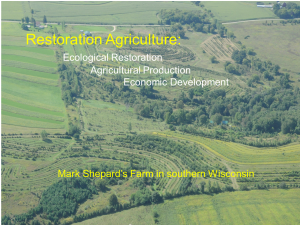 The overall indicator of their effectiveness is building a healthy soil and environment, while increasing the resilience of the farm enterprise to a variety of shocks. Millions of women and men farmers in Zambia, Malawi, Niger, Burkina Faso, and other countries are already practicing EverGreen Agriculture. 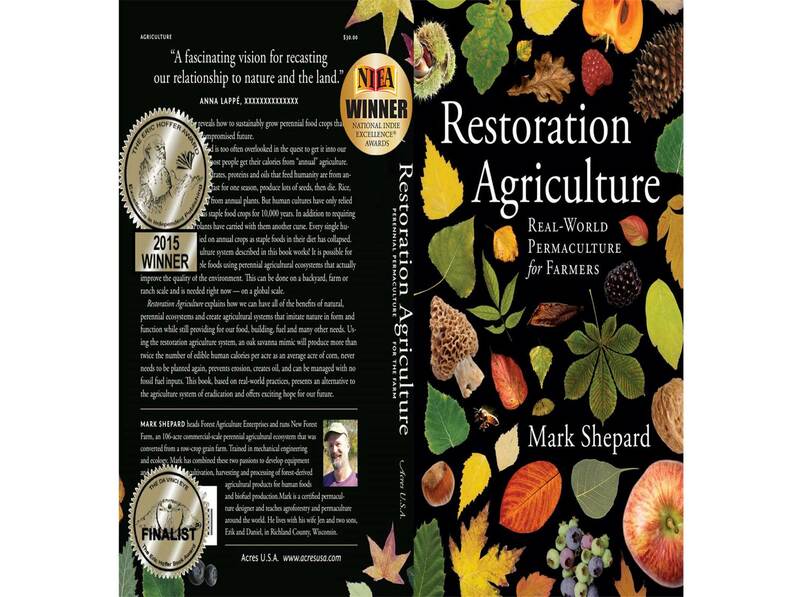 They are successfully restoring their exhausted soils with richer sources of organic nutrients, and dramatically increasing their crop yields and incomes. The integration of appropriate fertilizer trees into agriculture is a promising, but underappreciated, approach. EverGreen Agriculture contributes to integrated soil fertility management. It emphasizes the application of sound, tree-based management practices, and the knowledge to adapt these to local conditions, in order to optimize fertilizer and organic resource-use efficiency for greater crop productivity. A 1-10 MW power plant is sited in a rural area composed of smallholder farmers who are predominantly growing food crops in a maize-mixed farming system. 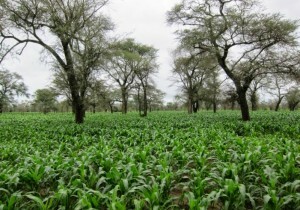 Gliricidia trees intercropped in the maize fields in a grid pattern. The trees produce wood and foliage that is harvested periodically during the year by pollarding the trees. 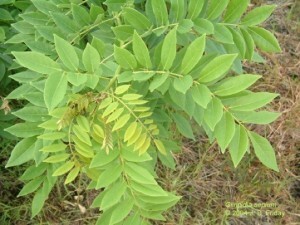 The foliage is stripped from the branches for high-protein livestock fodder and/or biofertilizer for the crops. The branches are removed and transported to the power plant as feedstock for electrical power generation. Such an integrated food-energy industry is envisioned to provide electrical power while at the same time enhancing food production and nutrition security, while improving livelihoods and advancing economic growth. Such systems can achieve these goals while conserving the environment and improving agricultural sustainability into the future. The electricity is provided to local rural consumers while any excess is provided to the national grid. The diagram below illustrates how such as system would operate to provide benefits at a household, community and national scale. The Gliricidia systems increase the on-farm production of firewood, a resource which is increasingly short supply in Africa smallholder agricultural systems. Farm production of adequate fuelwood saves the drudgery of women and children in travelling long distances to collect it, and this releases time and energy for other income-generating activities. It also reduces the destruction of natural forests by reducing the need to collect firewood from public lands. The increased supply of fuelwood that will be produced in association with the commercial production of glricidia for power generation will also ensure that the cooking and heating energy needs of the communities are amply met. Our vision is a fully-fledged, integrated and sustainable tree-based food-energy system (EverGreen Energy) that is operating and providing benefits to numerous communities across Eastern and Southern Africa. We envision that the systems will be providing rural electrification benefits to ‘powerless’ communities, enhanced income generation from growing the feedstock, increased crop production with enhanced soil fertility, and greater wood-fuel availability in rural areas. The next step is to foster South–South learning as a means to generate viable and successful development initiatives. We aim to facilitate the sharing of knowledge and experiences from Sri Lanka with interested parties across Eastern and Southern Africa (governments, communities, investors and power plant developers). In so doing, strong relationships across national and intercontinental borders will be fostered, allowing for ongoing cross-country sharing and co-learning to occur in the future beyond the life of the project. Feasibility analyses and public-private partnerships will be developed to pave the way for attracting and harnessing substantive levels of commercial and public sector investment in the development of an agroforestry-based energy industry in Eastern and Southern Africa, with an emphasis on implementing new commercial-scale projects that can fully demonstrate the potential for wide expansion.